Redding Rancheria is required by state law to distribute monies into the local non-indian community in an effort to offset the negative effects of Indian Gaming. Nothing in the law protects the Indian people around the Redding area from these same negative effects. Redding Rancheria kicked out (disenrolled) the Foreman Family in 2004. Redding Rancheria again uses monetary donations to coerce local non-Indian groups, while doing nothing for the Wintu Tribe or its members. While Toyon remains closed, and many Wintu remain homeless and without housing and a critical landbase. Redding Rancheria contributions FY 2013 to date total more than $94,000 and $2,055,700 total since the inception of the Fund. How many houses could be built for elders at Toyon with $2 million dollars, with an average of $50,000 per single senior unit? The answer is 40+ homes. Why do the people at Redding Rancheria refuse to help Wintu People? At least 2 grants for Wintu Community Projects were denied by Redding Rancheria in Fiscal Year 2013. 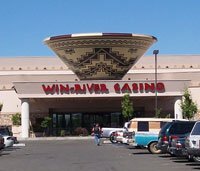 SWF is calling on community leaders to not accept Blood Money, or return monies from Win-River Casino thru Redding Rancheria, until the leaders of Redding Rancheria do the right thing and assist their own Wintu People first.